A few months ago, I came across an article from 2014 which published the results of a survey of over 1,100 people, including scientists, with the shocking revelation that 25% of people were unable to name a single female scientist. Looking back at my own education, I could understand how this would be the case – we studied Pasteur, Edison, Einstein, Volta, Newton, Darwin, Bell, Sanger, Crick, Watson, Dawkins, Hawking… the list was endless. The one female scientist I remember learning about in school was Marie Curie, although her name was always attached to that of her husband – always Pierre-and-Marie, never Marie alone. Kevlar was invented by the American chemist Stephanie Kwolek. Dorothy Hodgkin characterised the structure of the life-saving molecule insulin. Florence Nightingale, well remembered for being a nurse, was also a formidable statistician. Veena Sahajwalla developed green steel, using waste plastics in the steel and iron industries. Jane Goodall, Dian Fossey and Biruté Galdikas (my personal heroines!) were phenomenal women who carried out long-term studies on chimpanzees, gorillas and orangutans, respectively, in their natural habitats. 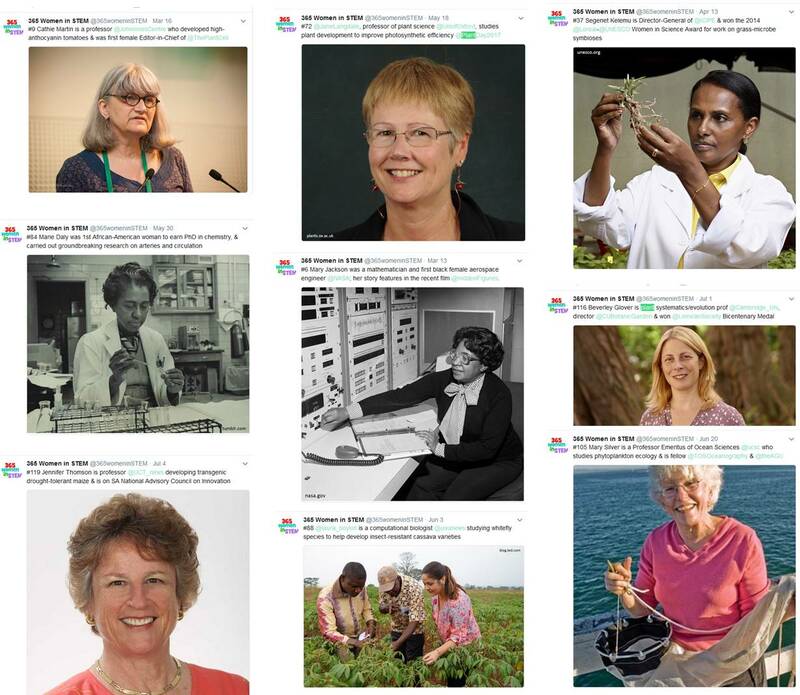 There are so many incredible female scientists around the world leading cutting-edge research or applying their scientific training in other professions; starting @365womeninSTEM was my attempt to highlight just a fraction of these people. There are far more than 365 women who are breaking boundaries in STEM; as @FraserLabCam recently commented, I “could go on for years and there would still be room for new fabulous women scientists”. When choosing who to feature, I particularly wanted to highlight women who had made significant contributions throughout history, and those who have been trailblazers, the first to achieve a particular feat. I also wanted to feature women of a range of disciplines, nationalities, ages, and backgrounds, and celebrate those who have used their scientific training to inspire young women to pursue careers in STEM. To keep the tweets varied, I have a (now pretty massive!) spreadsheet of women in STEM, which I am constantly adding to! The beauty of Twitter is that you are limited to 140 characters. Tempting as it is to write several hundred words on every one of the scientists featured, using Twitter means that you have to keep it brief, and hopefully also means that more people will make it to the end of what you have written! Twitter is also fantastic for reaching a large number of people; someone who wouldn’t necessarily go out of their way to search for “women in STEM” might be happy to click the “follow” button and periodically see your tweets on their newsfeed. I’m particularly excited to see that a number of teachers are following @365womeninSTEM. While there has been a recent effort to encourage more girls to pursue STEM subjects, the textbooks are still overwhelmingly dominated by male scientists. I’d love it if teachers used this project to make their students more aware of the enormous number of women with exciting and hugely successful careers in STEM, and particularly those who have broken down barriers to become the first woman to achieve a particular feat! Follow @365womeninSTEM to find out who will be featured over the coming days – and if you know an inspirational woman in STEM, please drop me a message over Twitter to nominate them! Josie studied Natural Sciences at Queens’ College, Cambridge, and is currently a postgraduate student at the John Innes Centre in Norwich. She is interested in plant pathology and studies protein-protein interactions during rice blast disease. Get in touch with Josie at @365womeninSTEM.